Objectives: Vitamin D deficiency is a controversial issue in pregnant women. The 1,25 dihydroxyvitamin D3 level is higher in pregnant than non-pregnant women. This study aimed to investigate the 1,25 di-hydroxyvitamin D3 status in vitamin D deficient pregnant women at the first trimester. Materials and Methods: This study was conducted during December 2011 and April 2012 in 2 hospitals of Istanbul, Turkey. Pregnant women who attended for the regular examination on the 12th gestational week were randomly assigned. They were divided into 2 groups including vitamin D deficient (vitamin D <30 ng/mL) and vitamin D optimal (vitamin D ≥30 ng/mL). Serum 25 hydroxyvitamin D3, 1,25 dihydroxyvitamin D3, fibroblast growth factor 23, calcium, phosphate, urinary calcium, and urinary phosphorus levels were measured. 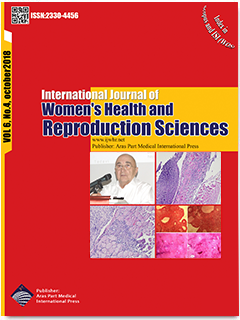 Results: After exclusion of fourteen pregnant women due to inconvenient serum samples, the mean serum 25 hydroxyvitamin D3 level of one hundred sixty outpatient pregnant women was 10.8 ± 16.2 ng/mL. Totally, 132 (85.0%) of these women were vitamin D deficient (25 hy-droxyvitamin D3 level less than 30 ng/mL). Serum 1,25 dihydroxyvitamin D3 and urinary calcium levels were higher in vitamin D deficient than vitamin D optimal group. Conclusions: Even under severe vitamin D deficiency, the 1,25 dihydroxyvitamin D3 level was high in pregnant women. Active vitamin D status was not compatible with the 25 hydroxyvitamin D3 level in vitamin D deficient pregnant women at the first trimester.